Even the most dedicated analog enthusiast might want a digital option now and then, if for no other reason but convenience. 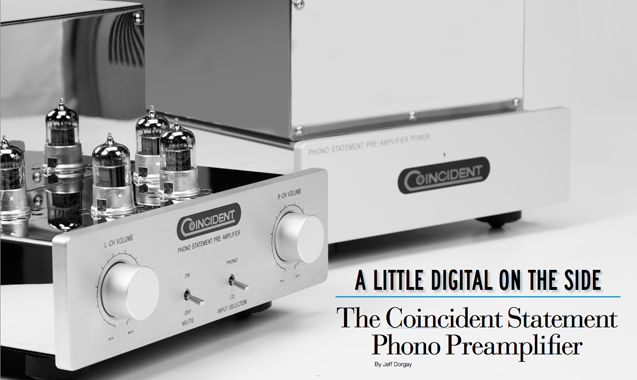 Should you be a minimalist analogophile craving a line-level input, the Coincident Statement Phono Preamplifier will be your dream come true. While many of the audio world’s famous preamplifiers include a highperformance on board phonostage, the Statement takes it a step further by including a line-level input along with a world-class phono and linestage. The Coincident offers a perfect balance of performance, elegance and simplicity that, for $5,999, won’t break the bank. That would be a great deal for a linestage or phono preamplifier alone, but getting them both on one chassis for this price has to be one of the best audio bargains going. And those chassis are highly polished stainless, so they will never tarnish or pit, staying beautiful forever. Don’t forget that combining both functions on one chassis eliminates the need for another expensive interconnect and power cord, sweetening the deal even further. slower pace—but this is a good thing. you have the patience, remove the bottom panels from each of the two chassis for the power supply and preamplifier. The power supply alone weighs 41 pounds, which is more than a lot of power amplifiers we’ve reviewed! The preamplifier chassis reveals an equally enticing attention to detail, with precision attenuators, Teflon coupling caps, Teflon tube sockets and meticulous point-to-point wiring throughout. A supplied umbilical cord that is easy to connect couples the two chassis together. 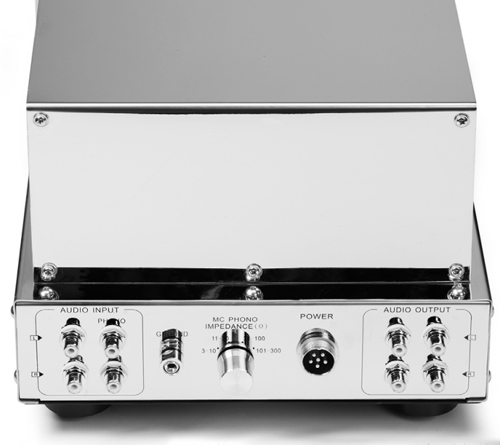 While there is only one line-level input, there are two line-level outputs, so the Statement can be integrated into a system with more than one power amplifier. Whether your system is multi-amped or utilizes a powered subwoofer, you’ll find this to be a nice touch. 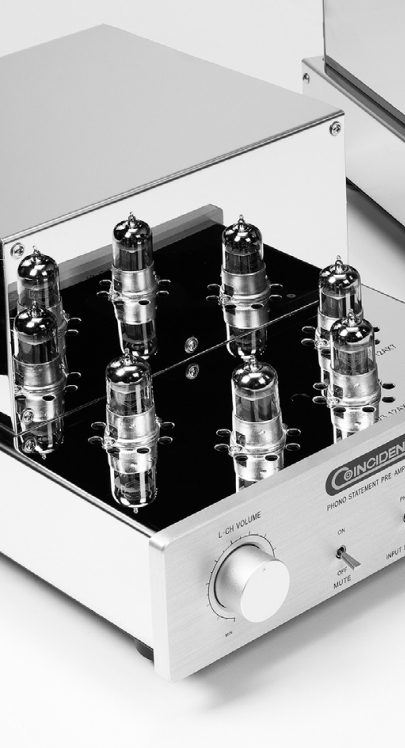 Thanks to its use of four 12AX7 tubes, the Statement should play music until the Earth cools, unlike a few other vacuum-tube designs that rely on exotic NOS tubes. The new factory-supplied Mullard tubes work incredibly well and for all but the most fanatic tube roller these will be the only tubes you’ll ever need—much like with the current Nagra preamplifiers. However, should you really have the itch, a set of EAT tubes or custom-matched Telefunkens will extract a few more molecules of music from this high-quality preamplifier—or it may just sound different to you. I suggest sticking with the factory tubes and calling it a day. I never find myself wanting to swap tubes other than for mere investigative purposes, but I’m a lazy tube roller, even on a good day. But I did use a wide range of phono cartridges to investigate compatibility with the Statement. When utilizing a precision-wound transformer that has four loading ranges (available separately for $2,499, for those of you requiring an MC step-up)—with impedance loads of 3 to 10, 11 to 30, 31 to 100 and 101 to 300 ohms—the only high-performance cartridge the Statement was not compatible with was my Grado Statement 1 moving-iron cartridge, which possesses a 0.5 mV output, but still needs to be loaded at 47k ohms. 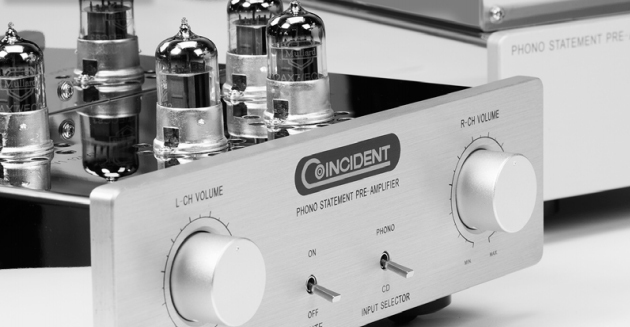 The sound of the Coincident Statement is unmistakably vacuum tube with step-up transformer: delicate and resolving yet ever so slightly softer in comparison to the best solid-state and hybrid designs. And it’s worth mentioning that my solid-state reference happens to be the 65-thousand-dollar Indigo Qualia, so the Statement is in damn good company. Neither is wrong, any more than preferring a Ferrari over an Aston Martin or vice versa, and the sound of your overall system will determine if this is a perfect match for you. Having listened to countless Coincident demos, it’s more than safe to say that in the context of an all Coincident system, with the company’s speakers (which are highly resolving, lightening fast and extended), the match is heavenly. Coincident consistently presents some of the most musically revealing sound out on the show circuit. Its gear always proves musical, dynamic and highly engaging. recording. Even though the drums are highly processed, they have more weight and particularly more decay than I’m used to on this record. If I had to sum up the Statement in only one word (though I have plenty of other kind words for the Statement), that word would be decay. This preamplifier does a phenomenal job at reproducing the subtle decay present in analog recordings—much like that feeling you get when playing back a great analog tape. Examining a Japanese pressing of Springsteen’s The Wild, the Innocent & the E Street Shuffle proves immersive. Listening to “The 4th of July, Asbury Park (Sandy)” through the Statement puts a new perspective on this classic. Not only does the bass line of this tune emerge from the mix, but the accordion also now permeates the track with it’s own voice and Clarence Clemmons’ signature sax floats in the space between the speakers, where it often loses its pace. And, of course, there is more rawness and more immediacy to young Springsteen’s voice, along with a few more layers of background vocals that I swore were not there before. I then switch program material to a more recent vintage, Low’s latest album, The Invisible Way, which the Statement renders forcefully, capturing the dynamics of drummer Mimi Parker’s big kettle drum on “Waiting” in a manner close to that of experiencing the band live. Iggy Pop’s latest record still sounds dreadful, so the Statement will not create magic where there is none—this isn’t a vintage Mac or Marantz tube preamplifier. What it does do highly successfully is achieve a near-perfect balance of musical resolution, without being harsh, and tonal contrast that is slightly on the warm side of neutral, yet it is never slow, rolled off or plodding. This is a pretty tough thing to achieve, even for a five-figure preamplifier, and impossible for a $5,995 unit—until now. The recent ORG pressing of Marianne Faithfull’s Strange Weather clearly illustrates the finesse with which the Statement handles the female voice. Faithfull’s voice, now seasoned by years of abuse, comes alive through the Statement, this time through the Lyra Atlas cartridge, via the AVID Acutus SP Reference turntable with TriPlanar arm. Moving to my other Acutus Reference SP, utilizing the SME V arm and Clearaudio Goldfinger cartridge, I discover that the Statement easily resolves the difference between these two premium cartridges, which possess very different yet equally enthralling characteristics: The Lyra proves the closest to neutral sounding that I’ve had the pleasure of using, while the Clearaudio is slightly robust and equally exciting. The Statement is also the perfect anchor for someone at the ground floor of assembling a music system based around a high-quality analog source. Even if a high-dollar table isn’t in your budget or on your rack now, the Statement has the capability to grow with your needs, no matter how you want to go. Moving downstream a bit to the VPI Classic 1 and Dynavector 17D3 proves equally satisfying, as does the Rega RP8/Apheta combination. As with many transformer-based phono setups, the Statement is a particularly good match with the Denon DL-103R and Ortofon SPU cartridges, so even audiophiles on a relatively modest budget will enjoy this one. True to the owners manual, the Statement needs about 100 hours to sound it’s best, so a couple of weekends and you’re good to go. That being said, it sounds damn good cold, right out of the box. As part of a minimalist system in room two, fed by the wonderful, four-box dCS Vivaldi digital playback system, the Statement is not outclassed in the least, its tube topology adding a bit of extra depth to digital recordings, even those reproduced via the Vivaldi. The rest of the system in room two is no slouch either: a pair of Sonus faber Guarneri Evolution speakers ($22k/pair), the D’Agostino Momentum stereo amplifier ($30k, also in this issue) and the SME 10 turntable with SME V arm, sporting a Sumiko Palo Santos Presentation cartridge. The Bad Plus’ Blunt Object: Live in Tokyo provides one of my favorite acoustic torture tests, with its driving, atonal rhythms, massive drums and thundering piano crescendos, punctuated with applause. Listening to the trio romp through their version of Blondie’s “Heart of Glass” is a sheer delight, with the drum kit sounding larger than life and all of the delicate piano work reproduced flawlessly. Another great word for the Statement is texture. Acoustic instruments sound incredibly natural and lifelike, with an abundance of timbre and tone, in a way that fools you into thinking you are actually hearing the real thing—the true test of any component, and the Statement passes it easily. Another relatively benign recording that really comes alive through the Statement’s line-level input is the self-titled debut from the Wallflowers. Granted, the dCS stack does its part extracting as much sound as could possibly be buried in that limited bit stream of a Red Book CD. Yet, there is much more separation between bandleader Jakob Dylan’s voice and the rest of the band than is normally there, with acoustic guitars fleshed out better, occupying their own distinct space better than before. There’s no question that the Coincident Statement can hang in the context of a six-figure system comprised of some of the world’s finest components. Interestingly, it’s easier to confuse young Dylan with a young Springsteen on alesser system, in terms of texture and vocal styling. The Statement reveals the difference between these two vocalists with crystal clarity, as it does when comparing Seal to Peter Gabriel—the differences in phrasing between them is now night and day. Not only did I purchase the review sample of the Coincident Statement, but we are also awarding it one of our Exceptional Value Awards for 2013. This product defines what we’re after for the category: top build quality and performance for which you’d expect to pay a lot more. I pulled the wool over the eyes (and ears) of a few of my audiophile buddies, who weren’t aware of Coincident, telling them that this preamplifier cost 25 grand—and they all believed me. I know I promised that I’d use my powers for good instead of evil, but it’s tough to resist with this one. 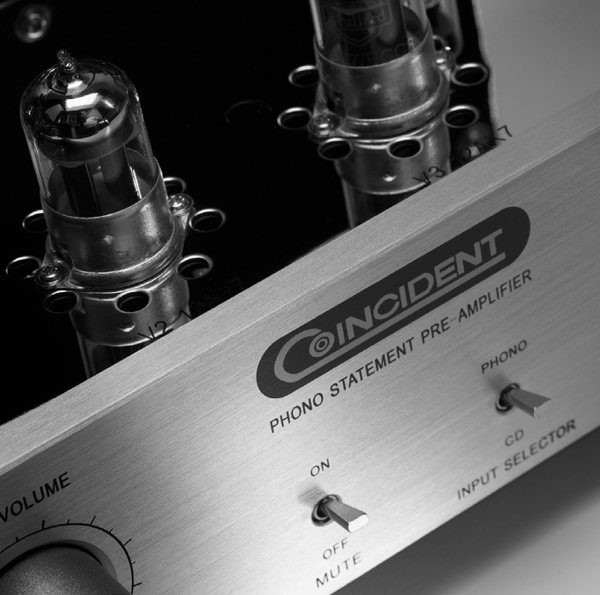 Bottom line, if you are an analog lover searching for the perfect anchor to a high-performance system, you need look no further than the Coincident Statement Phono Preamplifier—and you certainly need not spend any more money. We suggest this one very enthusiastically.